Civilian Casualties Are a Feature, Not a Bug, of War – Patrick F. Clarkin, Ph.D.
“The first pattern is that forbearance toward the helpless has always been instrumental rather than absolute.” Historians Mark Grimsley and Clifford J Rogers (2002: xii), on treatment of civilians in war over time. I agree with much of this, except for one non-trivial point: tragedies involving civilian casualties are not that isolated, unfortunately. Not all incidents will be nearly as visible as the deaths of four young children playing football on a beach near a hotel filled with journalists, or a commercial airplane shot out of the sky. But they are all tragedies nonetheless. Civilian casualties are a feature of modern war, not a bug. Civilian casualties. See references below for sources. And this is not exactly a new pattern or feature of ‘limited war.’ Instead, nearly a century of data suggests that civilians, not soldiers, have suffered the brunt of war, experiencing 67% to 90% of casualties across various conflicts since WW2. And many more civilians suffer through forced displacement, along with its short- and long-term effects on health (Bradley 2014). Perhaps we shouldn’t be surprised at these patterns, for the very simple reason that war is a sledgehammer, not a scalpel. It cannot easily excise some unwanted faction from a society without also cutting out several times more innocent lives. The real tragedy are not those ‘rare mistakes’ (which are not rare, really) that injure or kill civilians. It is the decision to go to war at all. Ahlstram C. 1991. Casualties of Conflict: Report for the Protection of Victims of War. Uppsala, Sweden: Dept of Peace & Conflict Research. This entry was posted in Refugees, War and health. Bookmark the permalink. Of course the title of your post is true . . . I guess the weird bit is that we seem to have developed some modern, naive idea that it’s not the case. I suppose that really does seem to be true if you live in Canada or America, where the wars aren’t happening at home. It’s one of the tacit myths of 911, that killing civilians isn’t kosher, as if we don’t do it, as if we didn’t bomb Baghdad . . .
Great title. There seems to be a common misunderstanding that the principle of distinction means that militaries are obliged to eliminate civilian casualties. But distinction has to be understood in conjunction with the other two fundamentals of the law of armed conflict, proportionality and necessity. 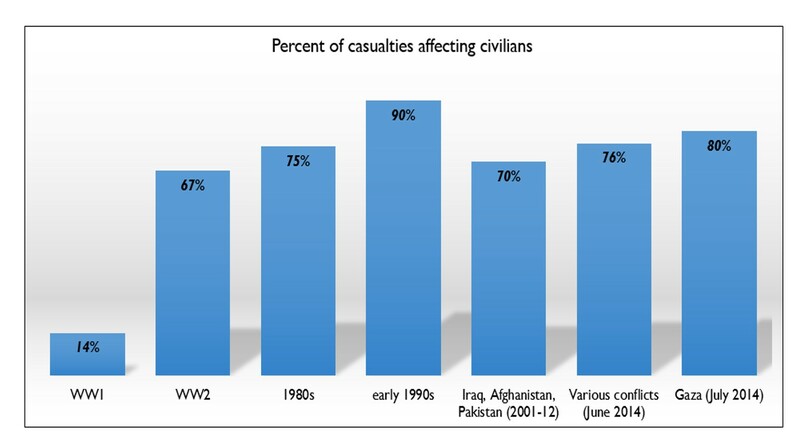 Those first principles take for granted that civilian casualties will occur during time of war, and realistically so. Good points. The principle of proportionality, in particular, always struck me as puzzling. If the main objective of war is to make the other side submit, it seems like proportionality – or at least perfect proportionality – can never hold. I might be wrong, but I think that no matter how honorable a soldier, officer, or politician may be, war creates conditions that compromise most principles. The principle of proportionality, in particular, always struck me as puzzling. If the main objective of war is to make the other side submit, it seems like proportionality – or at least perfect proportionality – can never hold. I might be wrong, but I think that no matter how honorable a soldier, officer, or politician may be, war creates conditions that compromise most principles. A plug for The Gatekeepers, which gets into that issue amongst others. Pingback: Some Thoughts on Syrian Casualty Figures | Patrick F. Clarkin, Ph.D.
Pingback: Monuments to Dignity – Patrick F. Clarkin, Ph.D.